The market approach offers you perhaps the most compelling way to determine the business value. Many business people and appraisal experts believe the market to be the ultimate judge of what a business is worth. In this sense, the business market value is revealed by the price the business fetches in an actual sale. Comparison against the sales of similar businesses is the next best thing - you can gather enough statistical evidence to price your business quite accurately. To set an asking price or offer price for a business acquisition. To defend your business valuation in a legal controversy or before the tax authorities. To justify your business value in a dispute such as partner disagreements or buyout. Market comparisons are an excellent way to estimate the very important fair market value of a business. This is by far the most common measure of business value – and is the de-facto standard used in most business valuations. You can use a number of valuation multiples to estimate your business fair market value. All such multiples are statistically derived ratios that relate the potential business selling price to some measure of its financial performance. Using the valuation multiples derived from comparable business sales, you can determine what your business is worth based on its recent revenues, net income, discretionary cash flow, EBITDA, total assets or book value, among others. For example, you can take the Price to Gross Revenues Multiple and multiply it by your business revenue figure. The result is the market-based estimate of what your business is worth. ValuAdder offers you a set of intelligent tools to quickly assess your business market value. First, you select your business type from among the list of industries. Next, you enter the key financial parameters for your business. 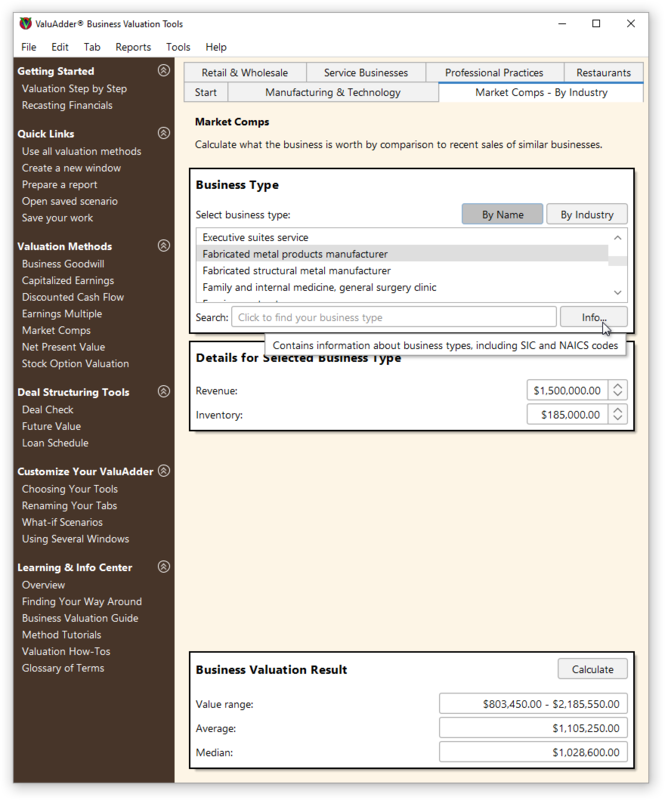 Finally, you calculate the fair market value range, average and median values for your business. You can also explore how the businesses in your entire industry group are priced by the market. This is very useful to estimate the value of businesses that generate income from a number of profit centers, such as product sales and client services. All in a matter of minutes!